Audi remains the brand with the highest number of cars entered in probably the strongest national GT3 racing series in Europe. On April 28–30, ten Audi R8 LMS start contesting the eleventh season of the ADAC GT Masters. The cars are spread between six Audi customer teams, three of which are present for the first time in this series. The customer teams and their drivers are supported by six Audi Sport drivers. Audi has already celebrated the overall victory in the ADAC GT Masters three times: Christian Abt in 2009, René Rast/Kelvin van der Linde in 2014 and Connor De Phillippi/Christopher Mies in 2016. The two champions from last year will be looking to defend their title with team Montaplast by Land-Motorsport. Their team mate Jeffrey Schmidt will share a cockpit with Christopher Haase. In 2007, Haase wrote history as the first ADAC GT Masters champion. In the South African Kelvin van der Linde from the Aust Motorsport team, another former title-holder will be in action in an Audi R8 LMS. Furthermore, Frank Aust’s team will provide a cockpit for a rising star from the Audi Sport TT Cup. Dennis Marschall is the 2016 runner-up from the Audi one-make cup. 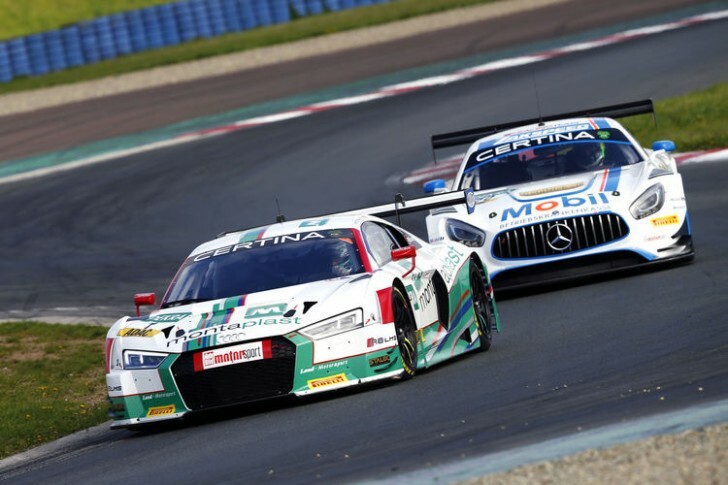 Yaco Racing, as another Audi customer team, has already proven that it is capable of victories with two race triumphs in the ADAC GT Masters. Three more teams will be relying on the Audi R8 LMS for the first time in this year’s ADAC GT3 racing series. The Audi Sport racing academy is giving a chance to the junior duo Mikaela Åhlin-Kottulinsky/Ricardo Feller, and is counting on Elia Erhart/Christopher Höher in the second car. The team BWT Mücke Motorsport has, among others, Markus Winkelhock and Frank Stippler in the cockpit – two established Audi Sport drivers who have already celebrated many endurance race victories. Marc and Dennis Busch also have endurance experience. The twins from Bensheim have already celebrated overall victories on the Nordschleife of the Nürburgring, and together face the challenge of the ADAC GT Masters for the first time with their family team Twin Busch Motorsport. The series has 14 rounds on seven weekends in Germany, Austria and the Netherlands and is considered one of the most professional and toughest national GT3 series. All races are broadcast live and in full-length by Sport1. Not only in the ADAC GT Masters is the Audi R8 LMS popular. In the German club sport racing series DMV GTC, six GT3 sports cars with the four rings are competing, as well as other customer teams in the VLN Endurance Championship Nürburgring. Also outside of Germany, Audi is represented in a national GT3 racing series in Europe: at the same time as the German opener in Oschersleben, the Italian GT Championship begins beyond the Alps. At Imola, Audi Sport Italia contests its ninth season in a row with the Audi R8 LMS. The Audi factory driver and three-time Le Mans winner Benoît Tréluyer and Vittorio Ghirelli are the confirmed drivers. Emilio Radaelli’s team has already won a drivers’ title, as well as two runner-up drivers’ titles and two team titles.